The Greatest Top 40 Music Radio Station Of All Time! This coming Saturday, The Rewound Radio DJ Hall of Fame will feature Bob Lewis! Plus, we'll also rebroadcast the last show Bob ever did on WCBS-FM from September 13, 1986. It starts at Noon (E) on Rewound Radio! This Week's Anniversary WABC Music Surveys! The great music of the Musicradio WABC Era all day, every day! "It's not how old it is... It's how GOOD it is!" career from his early days on into the 2000's. along with airchecks from Dan's days at WALK, WNHC, KBOX, WIL, WABC, WCBS-FM, WKTU, and more! Download it or listen to anytime! The introduction to this web site and why WABC was the "greatest Top 40 radio station of all time". Hundreds of WABC recordings including airchecks, interviews and promos. A chronological audio trip through WABC's time as a top 40 radio station. Every music survey from 1960-1982. The WABC Top 100 Songs of The Year lists from 1964 to 1982. WABC is the most famous radio station ever for its jingles from legendary companies like PAMS of Dallas, and JAM Creative Productions. Musicradio WABC: Those great DJ's! The complete list of the dates and times that each air personality was scheduled on WABC from December 1960 to May 1982. 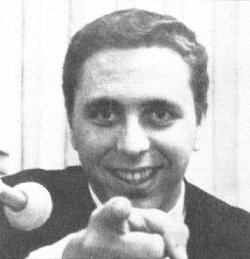 Harry Harrison did the "Morning Drive" show on WABC from 1968 until 1979. Harry contributed an unbelievable collection of memorabilia to this web site. Rick Sklar was the programming wizard behind Musicradio WABC. Glenn Morgan came to WABC as Assistant Program Director/Production Director in 1971. He became Program Director in 1975 and Operations Director in 1977. Al Brady was program director of WABC in 1979 and 1980. Les wrote his story and contributed airchecks. Frank Kingston Smith contributed some "inside" stories about some of his experiences at Musicradio WABC. WABC Engineer Bill Epperhart contributed a fascinating look at what it was like to be a Studio Engineer at Musicradio WABC. Bob Hardt was the voice of WABC News every afternoon during Dan Ingram's show. WABC successfully aligned itself with the greatest pop music phenomenon of all time: The Beatles. Why Did WABC Have Such a Great Signal? You really could hear WABC everywhere (or so it seemed). Julian Breen was Assistant Program Director at WABC from 1968-1971. It all came to an end on May 10, 1982. Before WABC moved to the famous "Avenue of The Americas" address, it was located at 1926 Broadway in New York. I wrote to Dan and got a letter back... in 1972! One of the greatest radio promotions anytime, anywhere! Scott Benjamin has contributed many tributes and profiles to the web site from those who worked at WABC during the Musicradio era. Here is the archive of his contributions. "Hi, Kemosabe! A Conversation with Dan Ingram" was a presentation Dan Ingram gave at the Museum of TV and Radio in New York City on October 25, 2001. Former WABC personality Harry Harrison did his final show on WCBS-FM on March 19, 2003. Former WABC Air Personality Ron Lundy retired from WCBS-FM on September 18, 1997. WABC re-created itself each Memorial Day between 1998 and 2009. It was inspired by this web site! Yearly surveys of the top songs of all time as voted by you! Discussion of current New York Radio topics! This page is not an "official" page, and is not created nor endorsed by the current or former management of radio station WABC. Except where otherwise noted, the information on this page is from items I personally collected or heard broadcast over many years and represents my personal interpretation and opinion of those events. All written material on the pages of this web site is the property of Allan Sniffen unless otherwise noted and cannot be duplicated or otherwise distributed without prior written consent. Image files are either the property of Allan Sniffen or are the property of the noted contributor and also cannot be duplicated or distributed without prior written consent. Musicradio77.com is part of the Rewound Radio non-profit 501(c)(3) educational organization dedicated to persevering the art of Top 40 Radio.